The percentage of Australian primary teachers who are male has noticeably decreased in the past thirty years. Education research has noted that men often leave the profession because of the gender related challenges they face in their profession. Challenges such as fear and uncertainty surrounding physical contact have been identified by numerous studies of male primary teachers, yet researchers have spent much less time investigating strategies to assist male primary teachers cope with these challenges. This research project aimed to address this gap through the identification of practical coping strategies that male primary teachers can use to deal with the gender related challenges they face in their profession. The falling number of male primary teachers is a concern for many key stakeholders who believe that more men are required, both in the classroom and in the wider school environment. These concerns have prompted numerous calls for increased male recruitment to, and retention in the primary teaching profession. Educational authorities in Australia have responded to calls for more men in primary schools by initiating policies designed to increase the numbers of male teachers. Despite the instigation of these recruitment-focussed initiatives such as scholarships and quota systems, the percentage of primary teachers who are male continues to fall. The continual decrease in male primary teachers suggests that more attention needs to be placed on the retention of male primary teachers already in the profession. 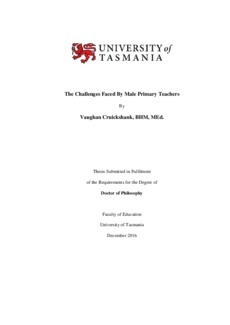 Therefore, exploring the experiences of practising male primary teachers was a key focus in this research project. The identification of practical coping strategies might allow more male primary teachers to deal with the gender related challenges they face, and persist within their profession. This study was conducted utilising a mixed methodology comprised of a survey and semi structured interviews. Social cognitive career theory (SCCT) was used as a lens to examine the challenges that influenced the retention of participants in this study. I initially surveyed participants’ perceptions of the gender related challenges identified in previous male primary teacher literature. Descriptive analyses (means, standard deviations, frequency counts, reliability, construct validity, and Rasch modelling) of these data revealed three gender related challenges that were most difficult for participants in this study. These challenges were uncertainty surrounding physical contact, an increased workload due to expectations to take on masculine roles, and social isolation caused by difficulties in developing positive professional relationships with teaching colleagues. These findings were used to construct questions for the interview phase of this study. Interview participants agreed that these three gender related challenges were the most difficult they faced in their profession and elaborated on them at length. Despite the difficulty of these challenges, no participants indicated they planned to leave the primary teaching profession. Rather, they detailed the coping strategies and supports that enabled them to deal with these challenges. These strategies included avoiding physical contact, using humour, and moving to public places to have one on one conversations with students As participants described how they dealt with the major gender related challenges they faced, a number of common themes emerged. These themes, which will be explored further within this thesis, included the influence of traditional hegemonic constructions of masculinity, schools perpetuating these societal constructions, and the importance of having strong support from teaching colleagues and school leaders.